Democracy means rule by the people, but in practice even the most robust democracies delegate most rule making to a political class. The gap between the public and its public officials might seem unbridgeable in the modern world, but Legislature by Lot presents a close examination of an inspiring solution: a legislature chosen through “sortition”—the random selection of lay citizens. It’s a concept that has come to the attention of democratic reformers across the globe. Proposals for such bodies are being debated in Australia, Belgium, Iceland, the United Kingdom, and many other countries. Sortition promises to reduce corruption and create a truly representative legislature in one fell swoop. In Legislature by Lot, John Gastil and Erik Olin Wright make the case for pairing a sortition body with an elected chamber within a bicameral legislature. Gastil is a leading deliberative democracy scholar, and Wright a distinguished sociologist and series editor of the Real Utopias books, of which this is a part. In this volume, they bring together critics and advocates of sortition who studied ancient Athens, deliberative polling, political theory, social movements, and civic innovation. The constellation of voices in this book lays out a wide variety of ideas for how to implement sortition, without obscuring its limitations, and examine its potential for reshaping modern politics. 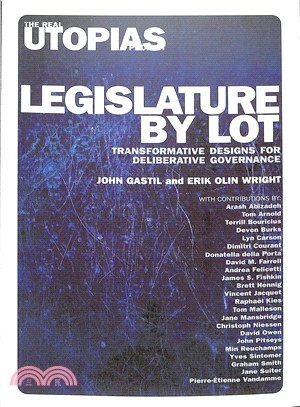 Legislature by Lot includes sixteen essays that respond to Gastil and Wright’s detailed proposal. Essays comparing it to contemporary reforms see it as a dramatic extension of deliberative “minipublics,” which gather random samples of citizens to weight public policy dilemmas without being empowered to enact legislation. Another set of essays explores the democratic principles underlying sortition and elections and considers, for example, how a sortition body holds itself accountable to a public that did not elect it. The third set of essays consider alternative paths to democratic reform, which limit the powers of a sortition chamber or more quickly establish a pure sortition body. John Gastil holds a joint appointment as Professor of Communication Arts and Sciences and Professor of Political Science at Penn State University. He is the author of?Democracy in Small Groups?and?By Popular Demand. Erik Olin Wright is Vilas Distinguished Professor of Sociology at the University of Wisconsin. He is the author of many books, including?Class Counts?and?Envisioning Real Utopias.